What's Paneer? 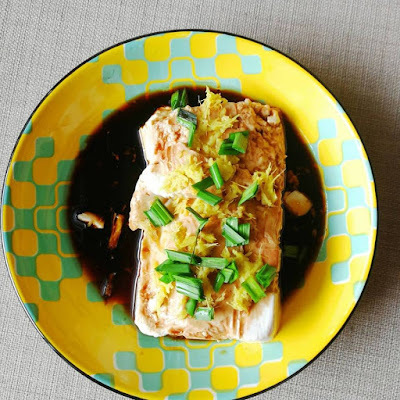 Some of my Chinese, Malay friends might not know what is it..well, Paneer is actually a type of curd cheese used in Indian, Iranian, and Afghan cooking. Today, I'm going to share with you my 4th guest post. 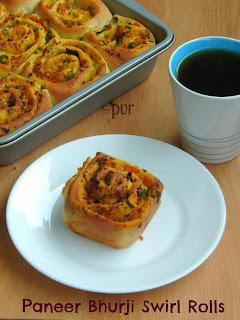 She made Paneer Bhurji Swirl Rolls for the invitation post. 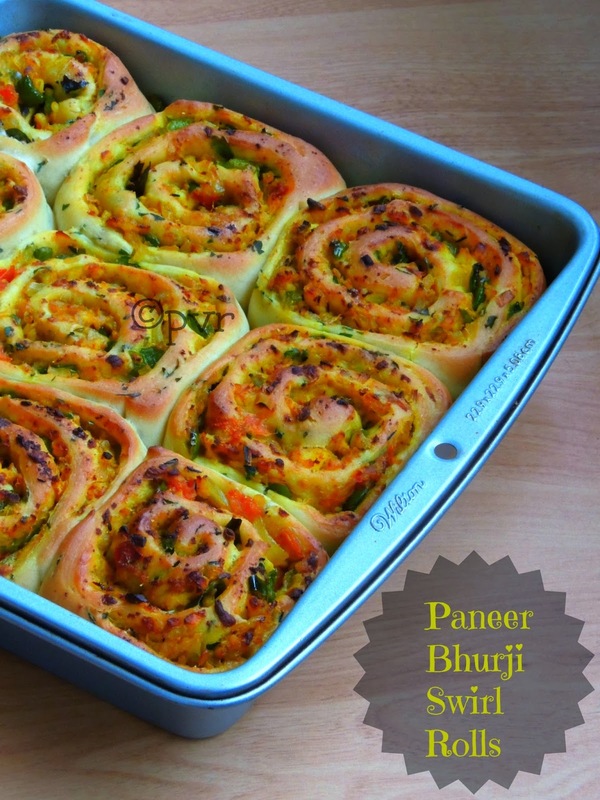 Priya not only share a great recipe but she also provide step by step method for all of us, how great?! Mix the yeast,sugar and salt in luke warm water and keep aside for 5minutes until the yeast turns foamy. Take the flour in a large vessel, add gradually the foamy yeast and olive oil, knead everything as smooth and soft dough. Now add the chopped parsley leaves and knead again for few minutes. Arrange the dough in a greased bowl,keep in a warm place for atleast an hour or let the dough gets doubled their volume..
Heat enough oil,lets crack the cumin seeds, add immediately the chopped onions, ginger garlic paste, saute until the onions turns transculent. Now add the chopped tomatoes,chopped green chillies, chopped bellpeppers,give a quick stir and add the turmeric powder, garam masala powder with salt, saute everything for few seconds. 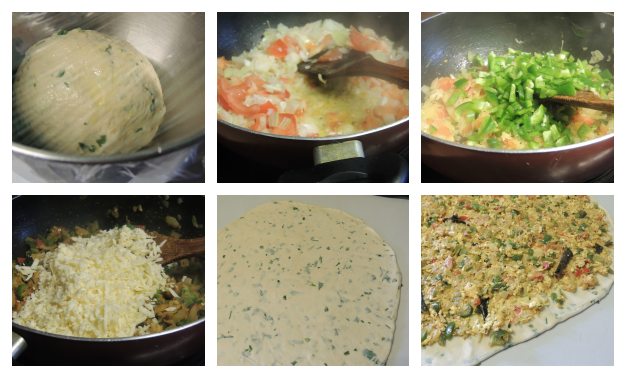 Finally add the scrambled paneer,put the flame in simmer,cook everything for few minutes (keep stirring continously). 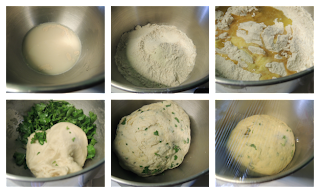 Punch down the dough and roll it as a large rectangle shaped disc. Now spread the already prepared paneer bhurji evenly over the rolled disc. Roll from an end to another to for a log shaped dough. Slice the log as 9-10 equal pieces. Arrange them on a greased square shaped baking mould, with some spaces between them. Let them sit again for half an hour in a warm place. Preheat the oven to 350F for few minutes. Bake the rised swirl rolls in the middle rack for 20-25minutes until the crust turns golden brown. Let them cool a bit. 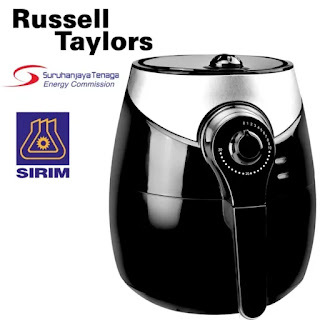 Serve warm with a cup of tea. 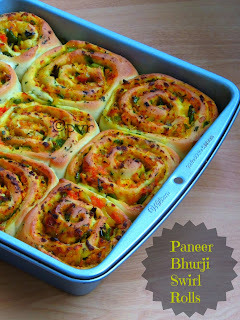 This is a beautifully made Paneer Bhurji Swirl Rolls...lovin' it. The photos are just amazing and appealing. I hope you'll enjoy this perfect rolls. Hey Shazzy, thanks for inviting me as ur guest, thanks for ur kind words,am honoured dear.Hope your readers will enjoy thoroughly this post. HeyPriya, thanks for being a part of guest :) it was nice knowing you. I bet they will loved this post! what an inviting paneer bhurji rolls... 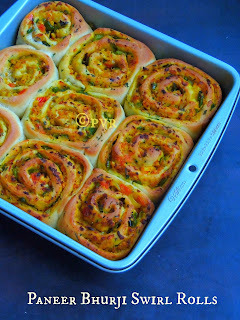 Perfect as always priya aks... n good guest post aks and Shaazy... am first time here... lovely space.. glad to follow u..
Wow Priya this looks super cool love the idea of rolls..Shazzy u have chosen the right person to bake the best. It does looks delicious menna.